Troy Weber’s phone rang in the early morning hours. When he saw the caller ID, his heart began to pound. After three years as Fleet Manager, he knew what the message would be: another injury, most likely to a driver. He hoped he was wrong or at least that it was not serious, but his mind was already racing over how he’d be able to manage the routes with a driver down. It seemed like the accidents, especially the slips-and-falls, should be preventable, but extra training on ‘three points of contact’ had not solved the problem. Even adding grab-handles to the cab seemed like a good idea, but that had actually added arm and shoulder injuries to some of the slip-and-fall cases. He had to stop drivers from getting hurt on the job. Joe, a long-time employee, had gotten hurt. His foot slipped exiting the cab and he twisted his ankle hard enough to tear a ligament. He would be out of work for a minimum of three months. Troy felt terrible because Joe was a hard worker who always followed safety precautions. 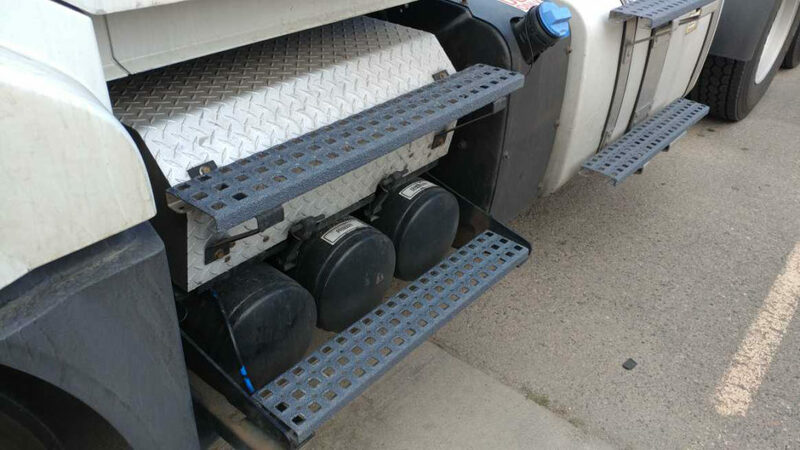 A closer look at the fleet’s truck steps showed extremely steep metal steps that are difficult for even the most fit drivers to navigate. They are perforated to allow for water and ice to pass through. But the serrated steel had worn down since the drivers may enter and exit the trucks up to fifty times a day. Worse, this type of step had no slip-resistant material at the leading edge of the step, where slips most often occur. The foot of a driver descending the steps would hit that edge and, without any added traction on the radius, would slip. Troy knew that the most effective controls involve elimination of the hazards. Luckily, he figured out that an anti-slip surface bonded to the truck steps could prevent this particular type of injury in the future. Better still, he discovered a similar solution could apply to ladders, running boards, and ramps – most any surface that becomes slippery and likely to cause slips-and-falls. Government statistics show that truck drivers are especially prone to slip-and-fall injuries. After Troy consulted with Erick Schuetz at Safeguard Technology, he confidently set a plan in motion to protect his drivers. Read the statistics on trucker injuries for yourself– and take steps to prevent injuries on your own vehicles.